And so on into infinity, with each new number being the sum of the two previous numbers. The next number in the series is therefore 89 + 144 = 233, and so forth. In more recent times, both mathematicians and non-mathematicians alike have become increasingly fascinated with the Fibonacci Sequence. The source of this fascination is the golden ratio, which is inherent in our universe in everything including nature, astronomy, biology, art and architecture. 1999 postage stamp from Dominica (the nature island) commemorating Leonardo da Pisa, known as Fibonacci (c. 1170 – c. 1250) whose number sequence defines nature. Table 1. Phi approximations obtained by dividing any Fibonacci number by it's predecessor. The greater the numbers, the more accurate the approximation. but can be approximated by dividing any number in the Fibonacci Sequence by it's predecessor. The larger the number, the more precise the approximation. The increasingly accurate approximations can be observed in Table 1 at left. Geographically, a very good approximation of phi is obtained by measuring the ratio of the distance from Kaaba at Mecca to the South Pole as a ratio of the distance between the North and South Poles. This gives an approximation with an accuracy similar to that provided by 34 / 21 from Table 1. Given the ubiquitous nature of the golden ratio in all of creation, it behooves one to seek it in the words of the Creator, the holy Bible. A cousin of the Fibonacci numbers is a sequence obtained by a similar technique, but beginning with the numbers 2, 1, 3, 4, 7... etc. Numbers in this series are called Lucas numbers (named after another mathematician) which also display interesting properties. Using the same method outlined above, Lucas numbers can also be used to approximate phi. It's true that the golden ratio can be approximated using many more number sequences, but the most accurate come from the Fibonacci and Lucas number series. For example, the number 5778 approximates phi to within 0.000000175% (5778 / 3571 = 1.1.61803416...). Adam and Eve, ceiling fresco from the Stanza della Segnatura. (detail) by Raphael. 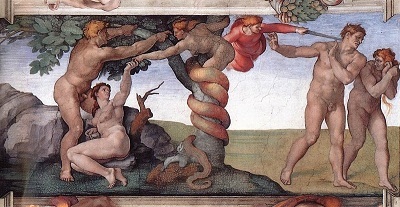 The day Adam and Eve ate therof, and came to know good and evil. In Hebrew, Jesus' name can be spelled either יהושע (Yehoshua, which means "Jehovah is salvation") or ישועה (Yeshua, which means "salvation"). When God drove out the man from the Garden of Eden, he placed Cherubims and a flaming sword to keep the way of the tree of life. In the Bible, the Tabernacle was the portable dwelling place for the divine presence from the time of the Exodus from Egypt until the conquering of the land of Canaan. Built according to specifications revealed by God to Moses at Mount Sinai, it was transported by the Israelites on their journey through the wilderness and into the Promised Land. It was replaced as the dwelling place of God by the First Temple in Jerusalem. Within the Tabernacle was a shrine (the Holy of Holies) and the Ark of the Covenant. Inside the Tabernacle, the Lord talked with Moses, and the children of Israel encamped round about. There are a total of 31,102 verses in the Bible. The golden ratio is applied to determine the "golden" verse, and it also relates to the Tabernacle. The prophet Jeremiah lived during one of the most devastating periods in Jewish history; the destruction of Jerusalem and Solomon's Temple which had replaced the Tabernacle as God's dwelling place. This destruction was followed by the beginning of the Babylonian exile. Jeremiah became a key figure in laying the foundations for the restoration of Jerusalem and the Second Temple. He firmly believed that once the period of punishment was over, the Israelites would return to their land and rebuild Jerusalem. Jeremiah Lamenting the Destruction of Jerusalem by Rembrandt (1630). The words "tabernacle" and "tent" are alternative translations of the same Hebrew word (﻿﻿אהל﻿﻿) Strong's H168. In the book of Revelation, the New Jerusalem is written as a cube 12,000 furlongs, and the number of the elect with his father's name written in their foreheads is 144,000. 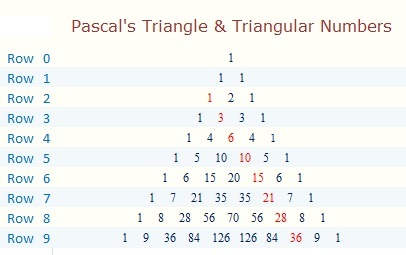 The first ten rows of Pascas's triangle. The sides are all "1's". All the other numbers are the sum of the two numbers above. 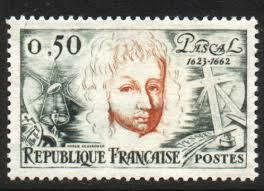 French postage stamp commemorating Blaise Pascal. Another interesting number pattern is Pascal's Triangle, named after Blaise Pascal, a famous French mathematician, physicist and religious philosopher. 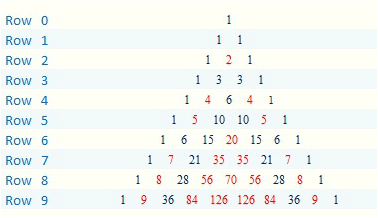 Pascal's triangle starts with "1" at the top, with numbers placed below in a triangular pattern. Each number is the sum of the two numbers above (except for the sides, which are all "1"). The numbers represented in Pascal's triangle are termed binomial coefficients. Triangular numbers are a subset of binomial coefficients. All triangular numbers are binomial coefficients, but not all binomial coefficients are triangular numbers. In the illustration, numbers that are not triangular are colored red. You can see patterns beginning to emerge (triangles within triangles. The notation for binomial numbers is based on a simple address matrix, according to row and column numbers (both starting with zero). For example, the number 20 is located at row 6, column 3. It's notation is therefore written as C(6,3) or ₆C₃ (C is for coefficient), whilst number 28 is written as C(8,2). 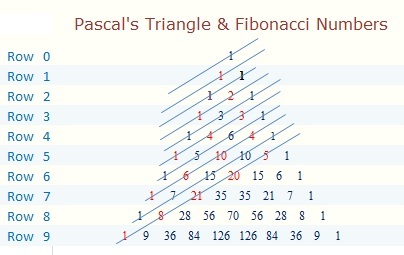 By drawing a series of diagonal lines, the Fibonacci number series can be calculated from Pascal's triangle. The numbers dissected by the lines add to the relevant Fibonacci number. The first diagonal dissects 1, the second diagonal also 1, the third diagonal 1 + 1 = 2 and so forth through the Fibonacci series. In another interesting pattern, the triangular numbers form a diagonal starting from Row 2 (the numbers colored red are the triangular number series). By arranging the binomial coefficients in a simple matrix explained in this video, the distribution of prime numbers form a spiral pattern (called a Ulam spiral), as seen in the diagram using numbers up to 256². The spiral arms are formed by triangular numbers, and the "noise" by non triangular numbers. The accompanying diagram uses the triangular numbers alone. The mathematical elegance of the triangular numbers is pertinent considering the triangular structure of the Bible's very ﻿first verse, and the reference to other triangular numbers in Scripture (see examples in John 21:11, Acts 27:37, Rev 13:18). Most of these numbers are encompassed in the 5778 triangle. A grid of abutted squares can be constructed based on the numbers from the Fibonacci sequence (1², 1², 2², 3², 5²..., you know the drill). By joining the dots, a spiral is obtained which is frequently observed in nature, as it is in art. Take a tour through the slide show gallery to appreciate the beauty that surrounds us every day, courtesy of the Creator. 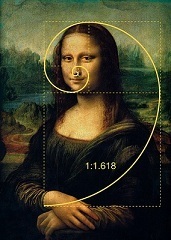 Mona Lisa by Leonardo da Vinci (1503 - 1517) with superimposed Golden Spiral. Hurricane Floyd near peak intensity on September 14 at 2030 UTC. This image was produced from data from NOAA-14, provided by NOAA. One of the most spectacular natural examples of the golden spiral is in the patterns described by hurricanes (from urikan, or "big wind" as the Carib Indians knew them). The 1999 Atlantic hurricane season had five Category 4 hurricanes - a record number for a single season. Scientists believe that although global warming may not be increasing the number of hurricanes per season, it may be increasing their strength. The third (and strongest) of the five major hurricanes in 1999 was named Floyd, a spectacular example of the golden spiral (photo at left and also featured in the slide show gallery). Floyd, which caused the third largest evacuation in US history, had it's beginning on September 7th, when it was designated as Tropical Depression Eight. It was upgraded to Tropical Storm Floyd on September 8th before reaching hurricane status on September 10th. In the Jewish tradition, Adam and and Eve were created on the 1st day of Tishrei (Rosh Hashanah). The first day of creation was six days earlier on 25th Elul. On the second day, God divided the waters from the waters, vapour above, water below Gen 1:6-8), and on the third day, He created land and sea (Gen 1:9-10). Then on the fifth day, God created animal life, including the sea creatures (Gen 1:20-23). 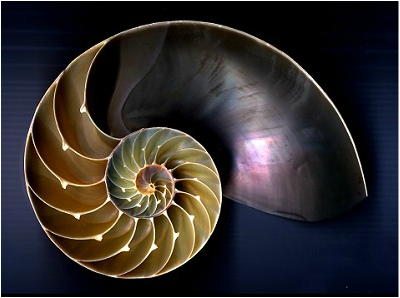 On a much smaller scale, the cross section of the Nautilus shell is probably the most precise and elegant expression of the golden spiral in all of nature, as evidenced in the images below. 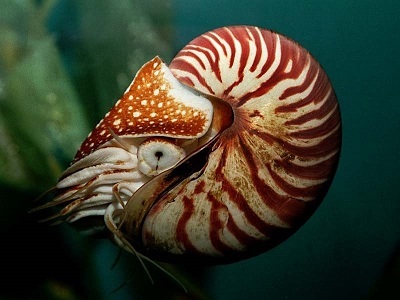 The chambered Nautilus is an odd yet beautiful creature that's been swimming in the sea for half a billion years without evolving much in all that time. Cross section of a Nautilus shell. Sadly, this beautiful creature may be headed for extinction, according to marine biologists. They are being fished out, due to their increasing popularity in the worldwide jewelry trade. There is great demand for its delicate shell with near-perfect spirals when cut in cross-section. Download a video of the Nautilus here, before it's too late (5.2 Mb). All 3 digit repdigits are divisible by 37, as also is the total gematria of this verse (2701 = 37 x 73). This repdigit design is also evident 13 verses later, when God said "Let there be lights in the firmament of heaven" (יהי מארת ברקיע השמים). Remarkably, in a search for the golden ratio in pi, the results were similarly punctuated with repdigits. The first occurrence of the 8-digit string 16180339 begins at position 19,445,230 (after the decimal point) in pi. There are two occurrences of 16180339 in the first 100 million digits of pi. The second occurrence begins at position 21118044 after the decimal point. This number not only includes repdigit 111, but also the gematria value of the Shema (Deu 6:4). Shema (שמע) is the Hebrew word that begins the most important prayer in Judaism. "Hear, O Israel: The LORD our God is one LORD:"
So it's ominous to note that the first occurrence of the 8-digit string 61803398 begins at position 62,078,146 in pi. The next four digits following this string are 5777, which year on the Hebrew calendar corresponds with 2016/2017 on the Gregorian calendar. The odds of an eight digit string appearing in the first 100 million digits of pi are 63%, so it's interesting to note that 16180339 and 61803398 each occur twice within this number set. No further occurrence of either 8-digit string is found within the first 300 million digits of pi. Pharaoh's Dream. Illustration by Owen Jones from "The History of Joseph and His Brethren" (Day & Son, 1869). Benjamin was the last born of Jacob's twelve sons, and the only founder of a tribe to be born in Israel. Benjamin was born on 11 Cheshvan, 2208 on the Hebrew calendar, and also died on 11th Cheshvan, 111 years later. The last biblical mention of Benjamin is in Rev 7:8, where "of the tribe of Benjamin" (εκ φυλης βενιαμιν) has an isopsephia value of 1331. The first appearance of the four digit string 2368 (Jesus Christ) begins at position 7481 after the decimal point in pi. Beginning at position 2368 after the decimal point in pi is the four digit string 3534. The only 9-string repdigits that appear within the first 500 million digits of phi are 222222222 (twice), 333333333 (once) and 888888888 (once).